A Pilot School is an autonomous small school. Pilot Schools were established in 2007 as role models of educational innovation and as research and development sites for effective teaching and learning in urban public schools. While Pilot Schools are part of Los Angeles Unified School District, they have autonomy over their instructional program, schedule, staffing, calendar and budget This increased flexibility enables the schools to further meet the needs of students and parents. To ensure the safety of all students and staff, RFK has implemented a Closed Campus Policy. Por la seguridad de los estudiantes y personal, la escuela RFK comenzara la poliza de Campo Escolar Cerrado. Para más informacíon oprime aqui. 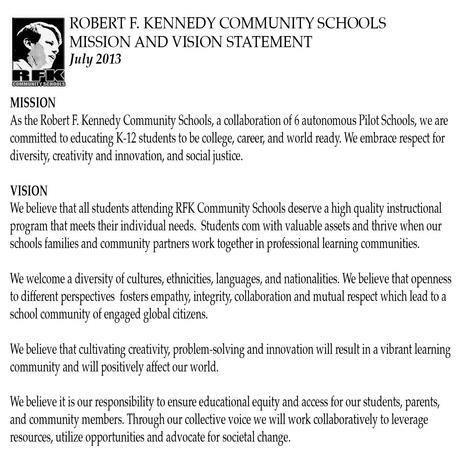 Robert F. Kennedy Community Schools welcomes you to our Website! RFK Community Schools is comprised of six autonomous Pilot Schools located at the site of the former Ambassador Hotel. The school was built to relieve underperforming and overcrowded schools located in the historically underserved neighborhoods of Pico-Union and Koreatown. 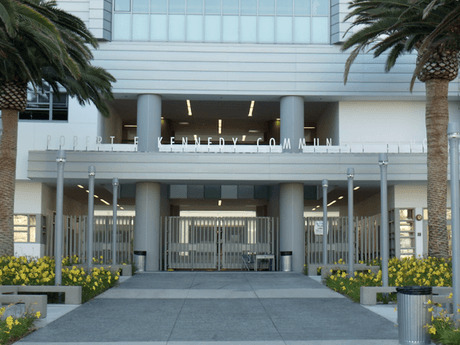 Students will be offered a rigorous and personalized instructional program that will embody the social justice legacy of Senator Robert F. Kennedy, who was assassinated at the Ambassador Hotel in 1968. RFK Community Schools is a 24-acre, Kinder through 12th grade campus. The schools will serve 4000 students during the 2011-12 school year. Some of the unique features of the campus include the world famous Cocoanut Grove Theater, Paul Schrade Library, state-of-the-art Gymnasium, and several public art installations including two Murals by Judith Baca. Schools include the Ambassador School of Global Education, Ambassador School of Global Leadership, NOW Academy, UCLA-CS, School for the Visual Arts and Humanities and Los Angeles High School of the Arts. RFK is a community school and all students must live in the attendance area. Kinder students starting the new school year must turn 5 years old by September 2nd. If you are transferring from another district please bring your transcripts. If you are receiving Special Education Services please bring a current IEP. We will make every effort to accommodate your request for a particular school however, some assignments are based on space availability. 2015-2016 9th grade students who live in our attendance area and attend Young Oak Kim Academy and Berendo MS will complete an online application at their middle school. All other students will who live in our attendance area will receive an application through mail. If you did not receive an application print one out by clicking below. WANT TO DONATE TO RFK COMMUNITY SCHOOLS? Support our school programs with a tax-deductible donation. Upon receipt you will receive a letter of recognition for your generous support along with the RFK Community Schools Tax-Identification number. RFK Community Schools has a FACEBOOK page! "Like" our status, get up-to-date info, and check out pictures! "Every day is an exciting day at RFK!" The Welcome Center is the central communication center for Robert F. Kennedy Community Schools.